Our coffeehouse opened in June of 2000 at 2-33775 Essendene Avenue, Abbotsford, British Columbia, Canada. 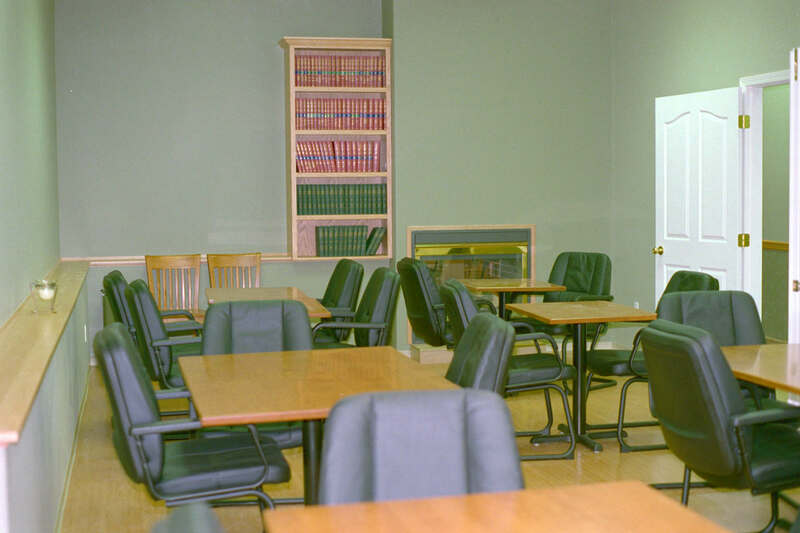 In addition to the main coffeehouse area, the coffeehouse includes a meeting room as shown below. Take a look at our new 'Weekly Specials' page which shows our food specials for the current week. We have live entertainment on Friday and Saturday nights. Our entertainment is generally a jazz pianist or jazz guitar player, but please call us or visit our 'Entertainment' page for more information. We show foreign or independent films in our meeting room on most Friday, Saturday and Sunday evenings at 7:00 p.m., and Sunday afternoons at 2:00 p.m. The movies are shown using a multimedia projector and a huge 8' x 6' screen. Please view our 'Music and Films' page for more information. Our events include poetry readings, book clubs, Philosopher's Cafe meetings and other special events. Please view our 'Other Events' page for more information.